Winnie & Walter September Rerun! 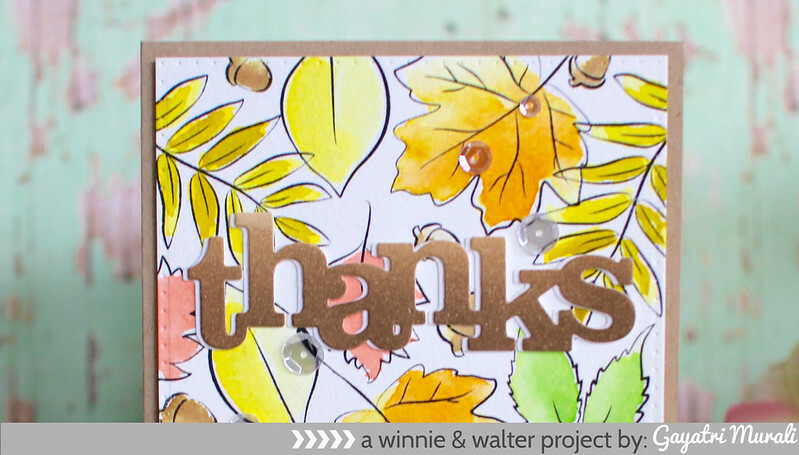 Sharing my card for Winnie & Walter’s rerun post today. Each month a product is featured with plenty of inspirations from designers using that product, a month long sale of that product and a challenge. There is also a new giveaway. You will not want to miss it. 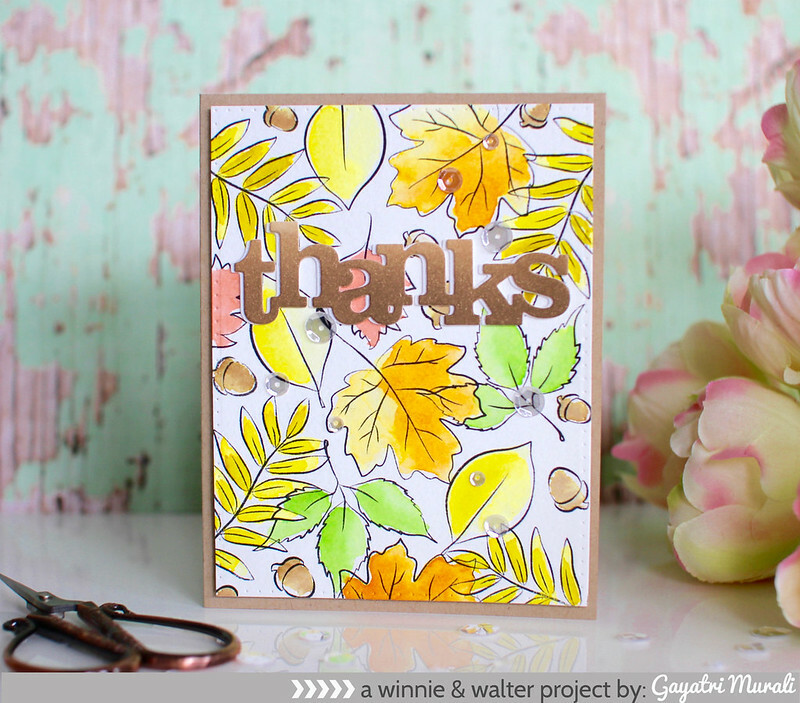 This month’s featured product is Renee’s Leaves stamp set. 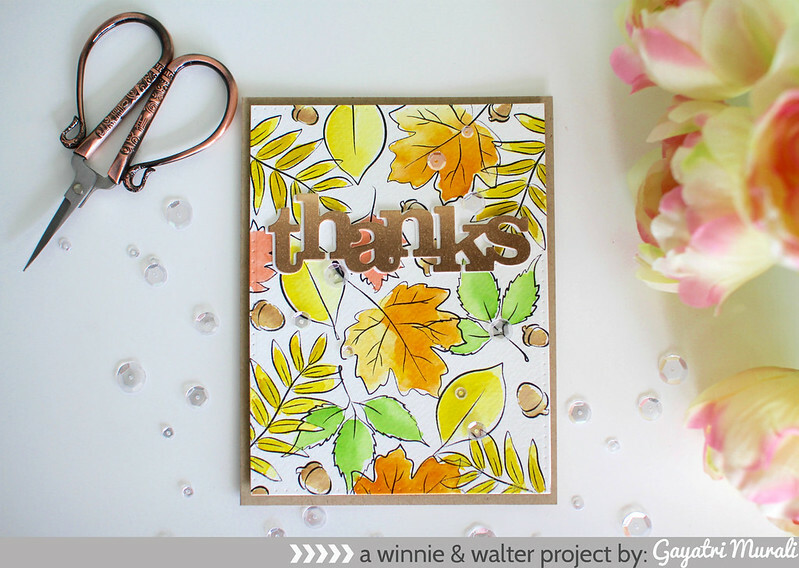 This is gorgeous stamp set full of leaves perfect for fall! I have used a few of these leaves and some loose watercolouring technique to make my card. I stamped the leaves from Renee’s Leaves stamp set on watercolour paper with black waterproof ink and used Zig clean brush pens to colour them loosely. Then I also added a second layer of shading again very loosely. I die cut this panel using the largest rectangle die from Essentials: Katharine Cutaway. I adhered this panel on kraft card base. The sentiment is from In a Word: Thanks Cutaway. I sponged Gathered Twigs distress inks on a white cardstock in an ombre and die cut the cardstock using the die. I then die cut two more out of white cardstock. I stacked and glued on of them with the sponged die cut and the other slightly offset like casting a shadow. I adhered this to the top centre of the card front. Finally Sparkly Clear sequins from Pretty Pink Posh to complete to card. Check out Winnie & Walter Blog for more details on the rerun feature and also details on how to play the challenge. This card is so much fun! It's got all of the spirit of Fall colors, but amped up a bit on the spectrum with some bright pops!